Aboriginal people find themselves at a real cross-road. Empowered by major court decisions and land claims agreements, Indigenous peoples have a clear and authoritative role to play in natural resource development. As a Senior Fellow of the Macdonald-Laurier Institute, I am co-Director of a multi-year project designed to generate public policy discussion and development on Aboriginal participation in this important economic sector. We have already produced scoping papers on the broad questions of Aboriginal engagement and on the Northern Gateway pipeline, both generating a great deal of debate and discussion. Our future projects will include such themes as the Royal Proclamation, the energy sector, development corporations, Indigenous employment strategies and community engagement activities. 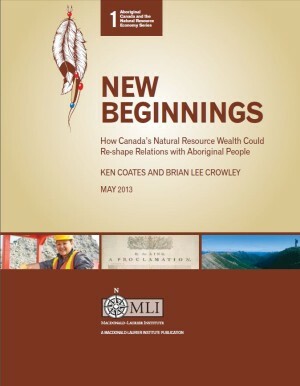 I work closely on this project with Brian Lee Crowley, Executive Director of the Macdonald-Laurier Institute and a well-known Canadian policy analyst. This project was started following a request by the Assembly of First Nations for a non-partisan, non-advocacy initiative on identifying opportunities and barriers in this field. Canada is in the midst of an unprecedented resource boom. For many Aboriginal people and communities, the resource activity is a once in a generation (or longer) opportunity for local economic development and employment. This project is designed to empower and inform Indigenous peoples and Aboriginal governments about the prospects and possibilities for more effective public policy in the field. 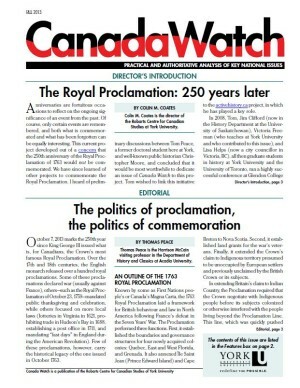 “The spirit of 1763: The Royal Proclamation in national and global perspective,” Canada Watch (Fall 2013), pp. 27-28. “Aboriginal Law (North America),” in The Oxford History of International Law (Oxford: OUP, 2013). 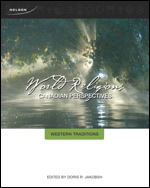 “Indigenous Traditions,” World Religions: Canadian Perspectives, Western Traditions, Doris Jakobsch, ed., (Toronto: Nelson, 2012). “From Panacea to Reality: The Practicalities of Canadian Aboriginal Self-Government Agreements,” Yale D. Belanger, ed. 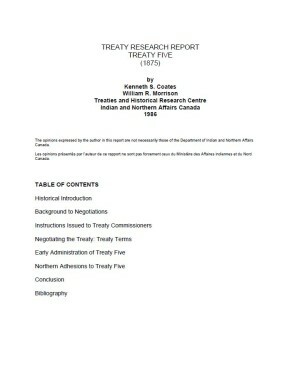 Aboriginal Self-Government in Canada: Current Trends and Issues, 3rd. Ed (Saskatoon: Purich Publishing, 2008). With W.R. Morrison. “Aboriginal Peoples and the Crown in Canada: Completing the Canadian Experiment,” in Hans Michelmann and Cristine De Clercy, eds., Continuity and Change in Canadian Politics; Essays in Honour of David E. Smith (Toronto: University of Toronto Press, 2006). With Greg Poelzer. 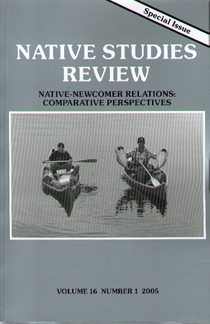 “Learning from Others: Comparative History and the Study of Indigenous-Newcomer Relations,” Native Studies Review, 16, no. 1 (2005), 3-14. “Reconciliation in Northern British Columbia? Future Prospects for Aboriginal Newcomer Relations,” The Northern Review, 25/26 (Summer 2005). With W.R. Morrison. 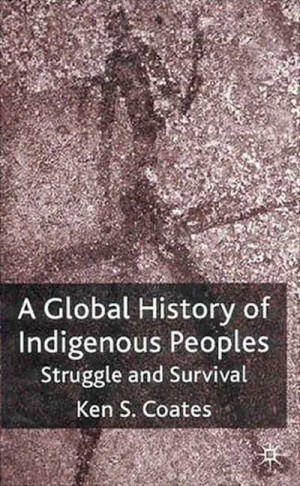 A Global History of Indigenous Peoples: Struggle and Survival (London: Palgrave/Macmillan, 2004). “Breathing New Life Into Treaties: History, Politics, the Law, and Aboriginal Grievances in Canada’s Maritime Provinces,” Agricultural History 77, no. 2 (2003). “Indigenous Rights in Canada,” Michael Tucker, Raymond Blake, P.E. Bryden, eds., Canada and the New World Order: Facing the New Millennium (Toronto: Irwin Publishing, 2000). 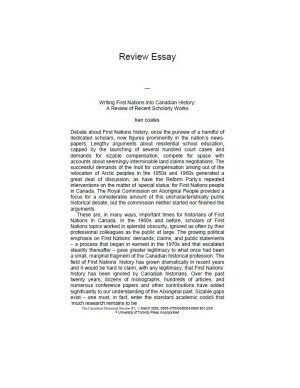 “Writing First Nations Into Canadian History: A Review of Recent Scholarly Works,” Canadian Historical Review, 81, 1 (March 2000). The Marshall Decision and Native Rights (McGill-Queen’s University Press, 2000). “Gentle Confiscation: The Settlement of Canada and the Dispossession of the First Nations,” in Paul Haveman, ed., Indigenous Peoples and the Law: Comparative Perspectives (Auckland: Oxford University Press, 1999), 141-161. “Native North Americans,” in Frederick Boal and Stephen Royle, eds., North America: A Geographical Mosaic (London: Arnold, 1999). With W.R. Morrison. “Aboriginal Self-Government in British Columbia,” and “The History of Aboriginal Land Rights and Claims in British Columbia,” in R. Kunin, ed., Prospering Together: The Economic Impact of the Aboriginal Title Settlements in B.C. (Vancouver: Laurier Institution, 1998). “To Make These Tribes Understand”: The Trial of Alikomiak and Tatamigana.” Arctic vol. 51, no. 3 (September 1998). With W.R. Morrison. 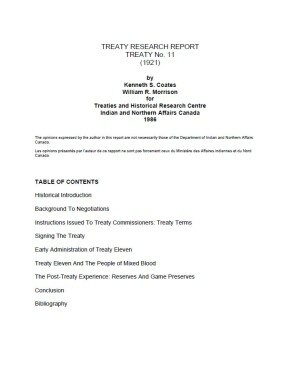 Living Relationships: The Treaty of Waitangi in the New Millennium (Wellington: Victoria University Press, 1998). With P.G. McHugh. 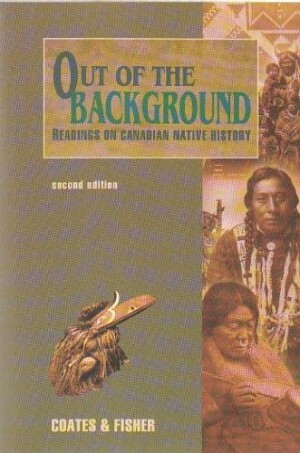 Out of the Background: Readings in Native History (Toronto: Copp Clark-Pitman, 1988). With Robin Fisher. Second (Revised) Edition 1996. Indigenous Peoples in Remote Regions: Comparative Perspectives (Thunder Bay: Centre for Northern Studies, 1995). With John Taylor. “Native People and the Alaska Highway,” in Chad Gaffield and Pam Gaffield, eds., Consuming Canada: Readings in Environmental History (Toronto: Copp Clark Ltd., 1995). With W.R. Morrison. “Lord Durham Revisited: The Cultural Struggle of Nations and Peoples within the Canadian State,” in H. Patrick Glenn and Monique Ouellette, eds., Culture, Justice and Law (Montreal: Les Editions Themis, 1994), pp. 1-18. “In Whose Best Interest? : The Federal Government and the Native People of Yukon, 1946-1991,” Rebirth: Political, Economic, and Social Development in First Nations (Dundurn Press, Toronto & Oxford, 1993). With W.R. Morrison. 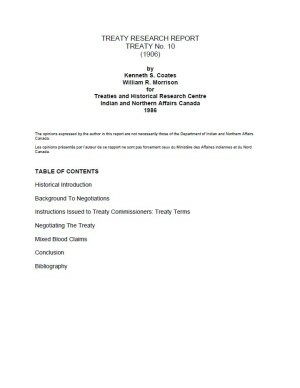 Aboriginal Land Claims in Canada: A Regional Perspective (Toronto: Copp Clark Pitman Ltd., 1992). “Indigenous Battles for Land and Cultural Rights in Australia and Canada,” in Henry Reynolds, ed., Indigenous Rights in the Pacific and North America: Race and Nation in the Late Twentieth Century (London: University of London, 1992). “Les Inuit Canadiens et les Baleiniers,” Destins Croises, Cinq Siecles de Rencontres Avec Les Amerindiens (Paris: UNESCO, 1992). With W.R. Morrison. Best Left as Indians: Native-White Relations and the Yukon Territory (Kingston: McGill-Queen’s University Press, 1991). “Towards an Indigenous Scholarship: The Case for a Northern-Based Research Capacity in Canada,” The Northern Review, No. 5 (Fall 1990). “On the Outside in Their Homeland: Native People and the Evolution of the Yukon Economy,” The Northern Review, No. 1 (Summer 1988). 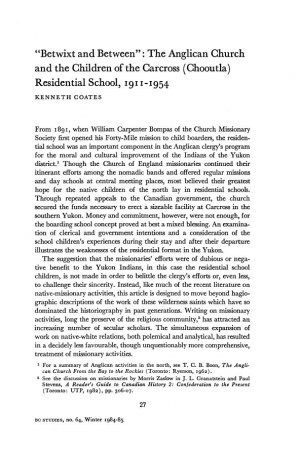 “A Very Imperfect Means of Education”: Indian Day Schools in the Yukon Territory, in Jean Barman, Y. Hebert and D. McCaskill, eds., Indian Education in Canada, Vol. 1: The Legacy (Vancouver: UBC Press, 1986). “More Than a Matter of Blood: The Federal Government, the Churches and the Mixed Blood Populations of the Yukon and the Mackenzie River Valley, 1890-1950,” in F.L. Barron and J.B. Waldram, 1885 and After: Native Society in Transition (Regina: Canadian Plains Research Centre, 1986). With W.R. Morrison. “The Alaska Highway and the Indians of the Southern Yukon, 1942-50: A Study of Native Adaptation to Northern Development,” in K. Coates, ed., The Alaska Highway (Vancouver: UBC Press, 1985). “Furs Along the Yukon: Hudson’s Bay Company–Native Trade in the Yukon River Valley, 1893-1983,” BC Studies, No. 55 (1982).